Everything on our planet, the atmosphere and beyond, is formed of energy! Our bodies have an energy field and energy flow that when blocked, unbalanced or weak can manifest in a negative state of health. Reiki is a life force energy delivered through the Reiki practitioner, to the client, to clear energetic pathways and stimulate the body's innate ability to heal itself. It is the safest, most powerful form of energy healing available to mend the body, mind and spirit. It was during my sister's breast cancer treatment experience that I became fully aware of the positive power of Reiki. Chemo treatments left her weak, sick, and questioning her ability to survive it all. Then, one day, I received a call from her and she sounded incredibly enthusiastic! She was so excited to tell me about the Reiki treatment she had just received as part of the complementary services offered through her oncology center. Reiki left her with greater physical energy. More importantly, it lifted her emotions, which are so important in driving our will and ability to recover. During her unique experiences, she received a sense of higher power presence that left her with the feelings that she wasn't "alone" and a "renewed hope" for recovery. It then became my mission to learn more about Reiki and deliver hope and better health to others...and it is with tremendous gratitude that I am able to do so! The clients I serve are being treated for various conditions involving stress, injury, pain, rehabilitation, or various illnesses, including cancer. In addition, I accept referrals from area medical centers to offer Reiki as an integrative medicine component for cancer treatment services. Originating in Japan, the technique results in stress reduction and relaxation that also promotes healing. 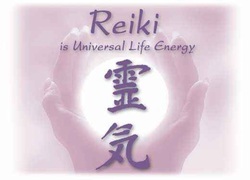 the word Reiki, (pronounced ray'-key), means "Higher intelligence guided life force energy." Reiki is an energy guided integrative or complementary care technique. It is delivered in private practices and hospitals, as well as in a variety of wellness and health treatment facilities. Reiki does not interfere with conventional medications or medical treatments. When used in conjunction with traditional medical treatments, Reiki has been found to reduce negative side effects of medications, encourage more positive patient attitudes and enhance recovery times.